Mario is a very practical little car. He can take 6 people or lots of luggage. 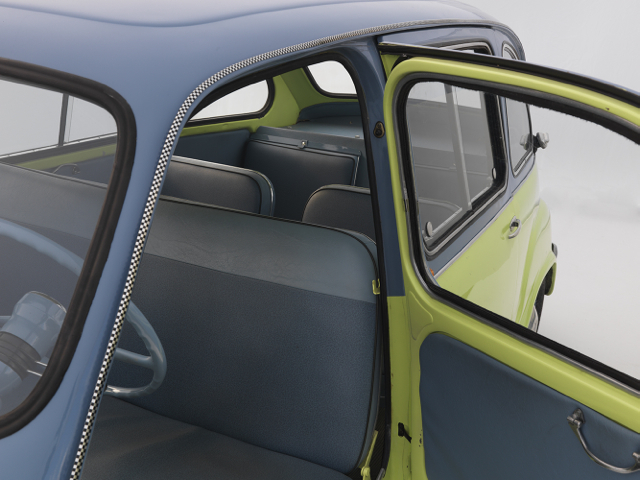 The Fiat 600D Multipla was a car considered to be ahead of its time and is the precursor of modern MPVs. Dante Giacosa, the leading design engineer for Fiat 1946-70, had designed the tiny Fiat 600 Saloon as a replacement for the popular Fiat Topalino as Italy’s ‘People’s Car’. However there was a problem as Italians had large families and they couldn’t produce an estate version because of the rear engine. Giacosa came up with a simple but ingenious solution to stretch the 600 creating a load area between the wheels. 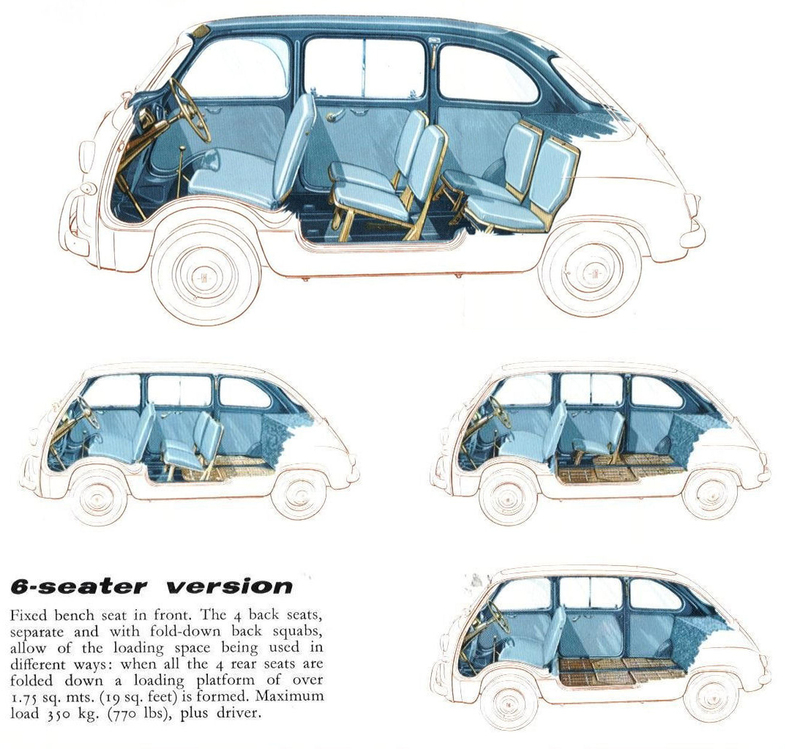 The front seats were moved forward over the wheels and a universally jointed steering column and uprated suspension increased the space and load capacity and the Multipla was born. 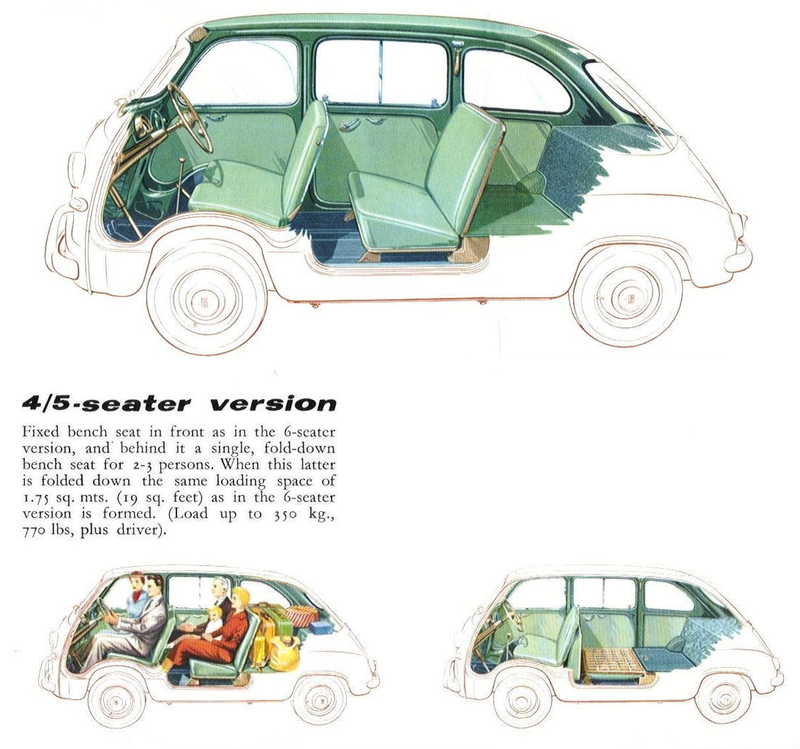 The first real MPV with six seats, of which the rear four fold completely flat into the floor to create a load area of 1.7sqm in a vehicle just over 3.5m long – only 50cm longer than a Mini. 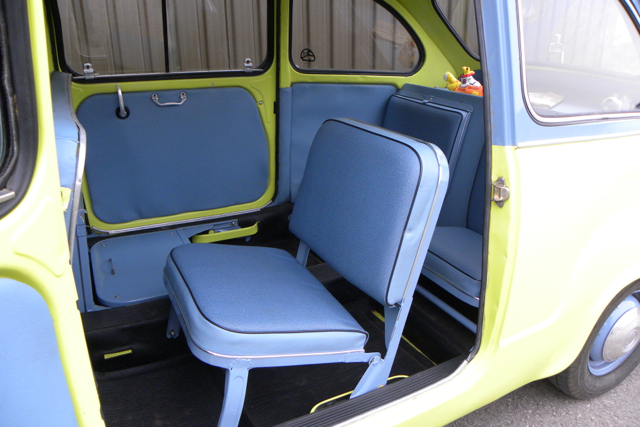 The two wide doors hinged at the same pillar allow for good access to the load/passenger area and all in a vehicle powered by a tiny 767cc engine. They also produced a version with two bench seats and luggage space behind and a taxi version with luggage space beside the driver. 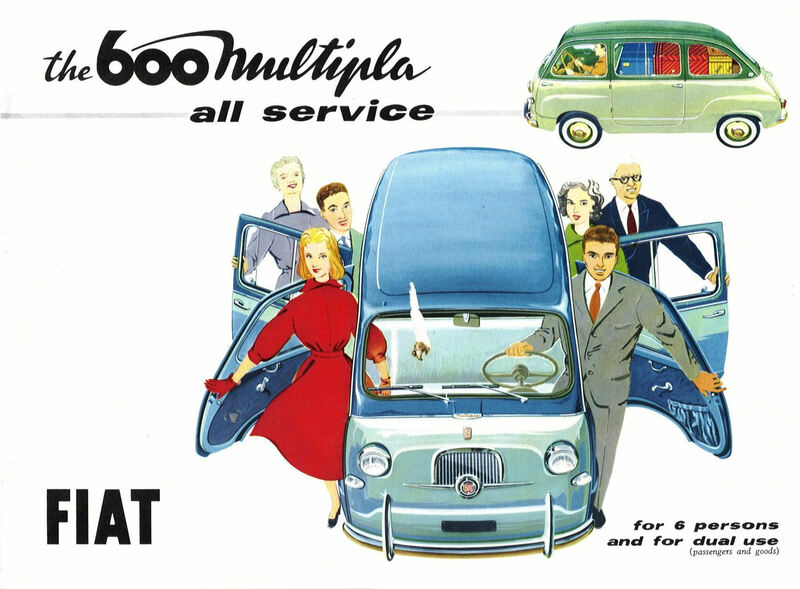 From the promotional material for the Multipla… “The Multipla was advertised as the 600 all service with increased accommodation and a greater variety of uses. It is the 600 for 6, 6 people, 6 seats. It is the dual purpose 600. 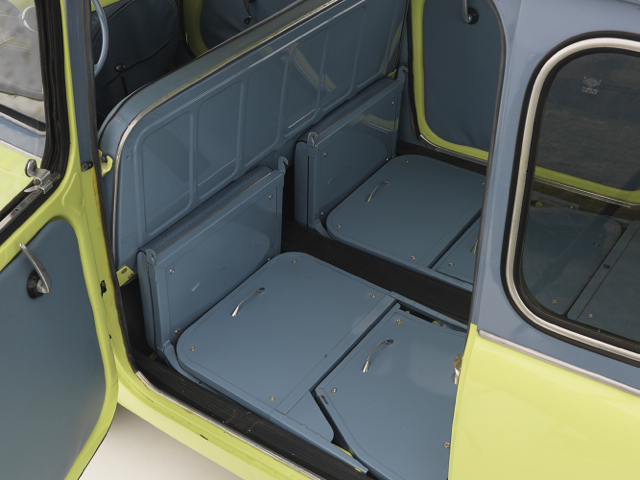 When the rear seats are not occupied, their squabs can be folded down, thus forming a platform which provides a large loading space for luggage, goods and various articles. Mario started life in Rome. We know that previously the car was owned by a plumber, who made good use of the space for his plumbing equipment but could still take his family out at the weekend. 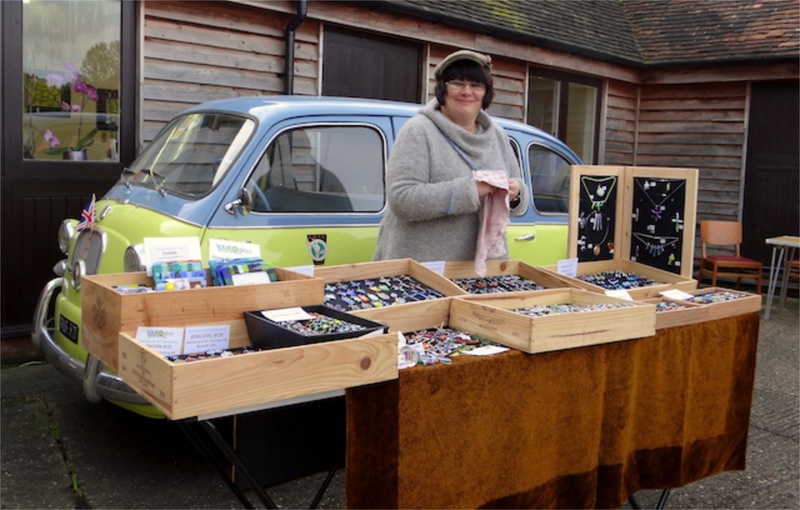 We continue to make use of the versatile space by taking friends out and transporting our luggage to Goodwood and Jane’s glass stall to events. 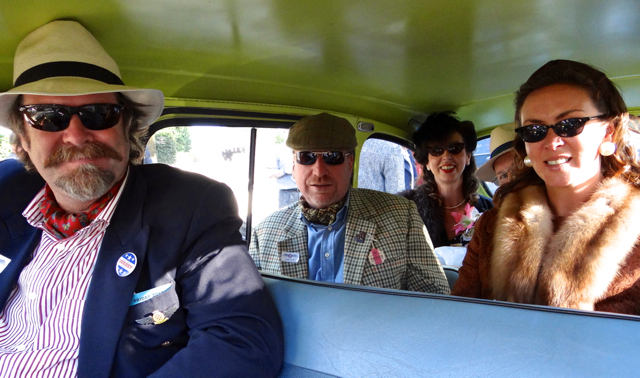 The seats are quick and easy to fold into the floor which gives us a large flat area to put chairs, tables and picnics in the summer and of course Mario is used as a taxi at the Revival where he can carry up to five guests.